Home » Market » 20 stocks rose 10-40% this week; is the market momentum sustainable? Profit booking hit D-Street as both Sensex and Nifty closed off from their respective highs. The S&P BSE Sensex held on to its crucial psychological support at 38000 while the Nifty50 failed to close above 11500 levels for the week ended March 22. On a weekly basis, Nifty50 closed marginally in green while the Sensex rose 0.37 percent. The S&P BSE Mid-cap index slipped 0.59 percent on Friday while the S&P BSE Small-cap index was down by 0.44 percent in the same period. 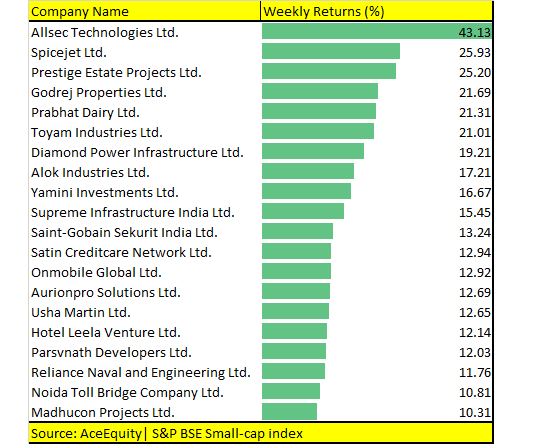 Even though small-cap stocks underperformed, as many as 20 stocks in the S&P BSE Small-cap index rose 10-40 percent in five trading sessions which include names like Madhucon Projects, Usha Martin, Satin Creditcare, Saint-Gobain, Prabhat Dairy, Godrej Properties, SpiceJet, and Allsec Technologies. In the S&P BSE 500 index, as many as 5 stocks rose – InterGlobe Aviation, Reliance Communications, Godrej Properties, Prestige Estate, and SpiceJet rose 10-20 percent in the same period. Will the momentum continue in markets? The Nifty50 and Bank Nifty continued their upward journey for a fifth consecutive week where they gained by 0.26 percent and 0.7 percent respectively. The NiftyBank hit a record high of 30,008 before witnessing selling pressure which pushed the index lower by 249 points on Friday. To a certain extent, yes, we could say the market may be losing momentum. At least there are initial signs which suggest that. However, is it a worry? Maybe not, as long as foreign institutional investors (FIIs) continue their buying spree. The Nifty50 rallied by about 1,000 points from 19 February largely led by strong inflows by FIIs, who have poured more than Rs 26,000 crore in March and more than Rs 40,000 crore since February 19. “The current consensus is building for markets to go higher and higher but it is fraught with risks. FIIs have also pumped in the net $4.5 billion in the past month which has boosted this rally. Traders are riding on the re-election bandwagon of the ruling party, but election results are still 2 months away and the outcome is highly unpredictable,” Umesh Mehta, Head of Research, Samco Securities Ltd told Moneycontrol. “Hence, such risky bets must not be taken. Going into the next week, markets are likely to remain volatile as fresh triggers look weak going forward. Since the financial year is coming to an end, liquidity –at least from the debt markets – will seep out,” he said. Mehta further added that some amount of redemption is likely to put pressure wherein domestic institutions are expected to remain net sellers. No sooner the liquidity tap of FIIs dries out, markets will begin to correct swiftly. On the Options front, maximum Put OI is placed at 11000 followed by 11200 strikes while maximum Call OI is placed at 11600 followed by 11500 strikes. Put writing is seen at 11600 followed by 11450 strikes while meaningful Call writing is seen at 11600 followed by 11500 strikes. Option band signifies a trading range in between 11300 to 11600 zones. “From derivative markets, we decipher long build up in the Nifty Futures’, short covering in the Bank Nifty Futures’, Put writing at 11300-11500 level and FIIs’ buying in the Index futures’ segment. 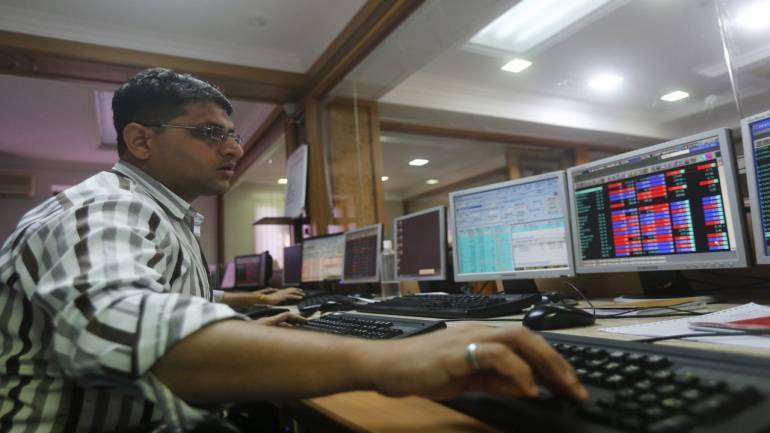 These cues indicate that one should remain optimistic for the coming March Expiry week with the stop loss of 11300 levels,” V K Sharma, Head PCG & Capital Markets Strategy, HDFC Securities told Moneycontrol. “The markets no doubt are in an overbought zone, but they can be overbought for a longer period of time than short sellers can be in business. The next logical resistance for the markets is at 11,760, the all-time high mark, the Nifty saw in August last,” he said. India VIX moved up by 1.53 percent at 16.27 levels. Volatility fell down from highs but slightly moved from its base of 14 zones so some volatility cannot be ruled out.